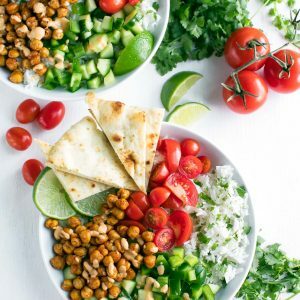 These Chickpea Shawarma Bowls make healthy eating a breeze! Each tasty vegetarian grain bowl is loaded with fresh veggies, crispy chickpeas, and topped with an easy peasy tahini sauce. So first off, SHAWARMA FREAKING CHICKPEAS. I couldn’t love them more if I tried! A bit of roasting time in the oven and an easy peasy blend of shawarma-style spices transform an unsuspecting can of chickpeas into crispy little flavor bombs perfect for topping everything in sight! We love them on soup, salads, tacos, and by the handful. Naturally the next step was to make a vegetarian version of my popular Chicken Shawarma Quinoa Bowls and give these shawarma-spiked chickpeas all the attention they so clearly deserve. So to make your shawarma spice blend, you’ll need a mix of salt, ground cumin, smoked paprika, ground turmeric, and cayenne pepper. You can also add a little black pepper to the mix and some freshly grated lemon zest for a burst of citrus flavor. I like mine spicy and always add a little extra cayenne to the mix! I opted for a rice bowl here, but you could embrace your inner grain bowl addict and choose quinoa for the base as well. Freekeh and cous cous could work too. Feeling more of a salad vibe? 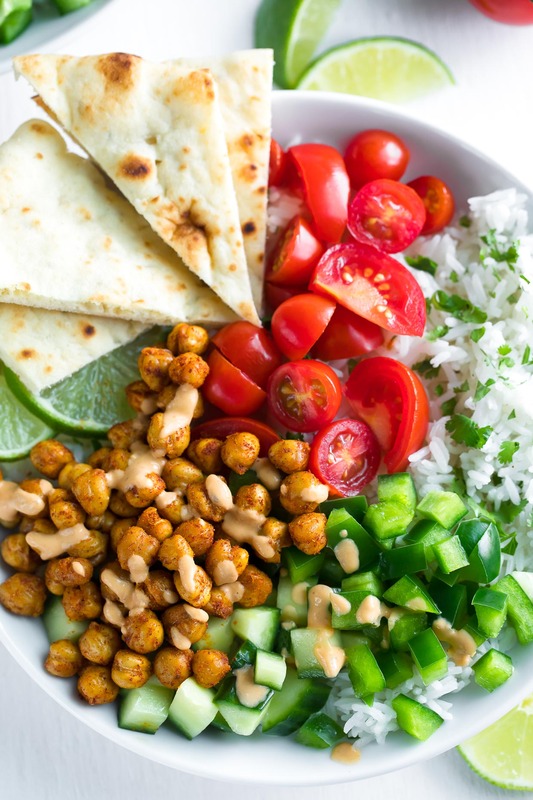 Skip the grains altogether and serve your chickpeas, veggies, and sauce over a bed of leafy greens! No tahini? No problem! I’ve included the recipe for my handy dandy hummus sauce which you can make using leftover homemade or store-bought hummus. 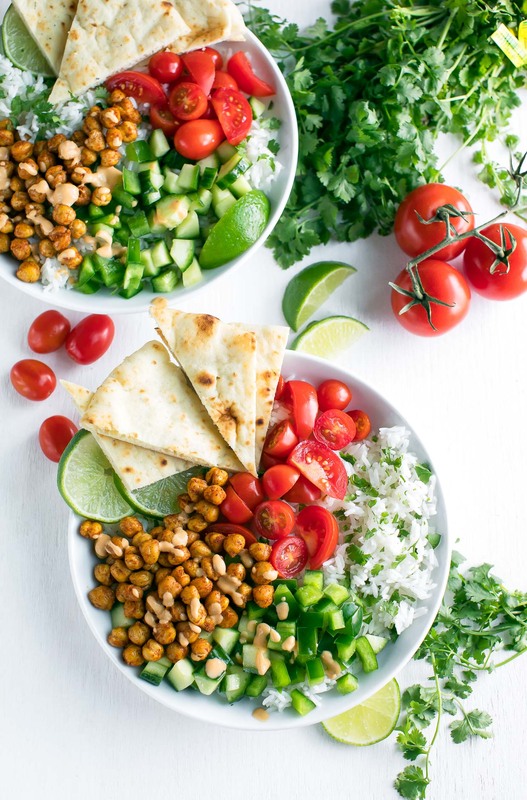 These chickpea shawarma bowls feature fluffy rice, fresh veggies, seasoned chickpeas, and a tasty tahini sauce. When combined, they make most plate-licking plant-based deliciousness evahhhh! 1/4 cup hummus any flavor! Cook rice via package directions using your favorite method. Once cooked, fluff with a fork and season with fresh lime juice (start with 1/4 a lime and add extra to taste). Set aside. Once cooled, add fresh cilantro (to taste) and mix well. While your rice cooks, roast your shawarma chickpeas. Drain and rinse your chickpeas. Pat the chickpeas dry with a clean dishtowel. The drier the chickpeas are, the crispier your end result. If you have time, leave them to air-dry for a few minutes. Add chickpeas to a rimmed baking sheet and add oil and salt. Mix until chickpeas are lightly coated. Roast on the center rack for 20-25 minutes until crispy on the outside and soft in the middle. Once chickpeas are fresh from the oven and still hot, add your remaining shawarma spices and mix well. For the sauce, choose your favorite from the list above and whisk together until smooth and pourable. Adjust to taste if needed and feel free to make extra! Let's get our bowl on! 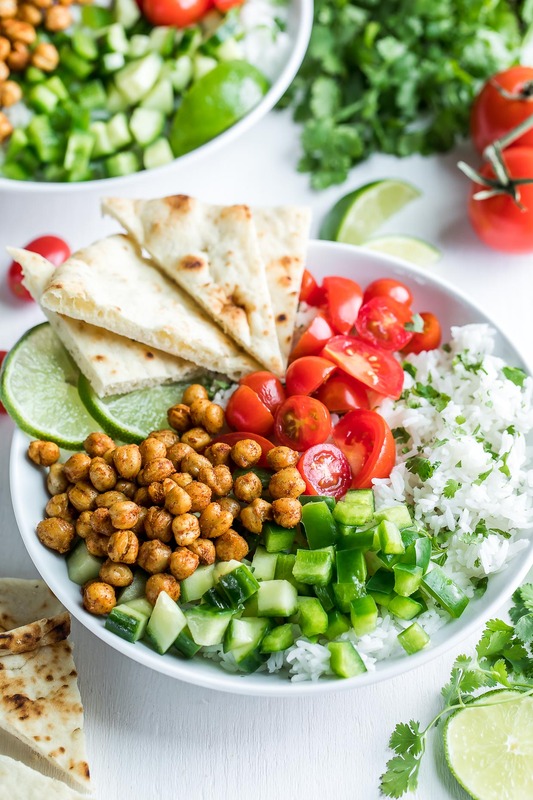 Divide rice, veggies, and chickpeas between two bowls. Serve with lime wedges, drizzle with sauce, and dive in! Feel free to use fluffy quinoa in place of the rice or serve your chickpeas, sauce and veggies over a bed of leafy greens in place of grains. Nutrition Facts below are an estimated with an online recipe nutrition calculator before sauces are added. Adjust as needed based on sauce choice and extras and enjoy! 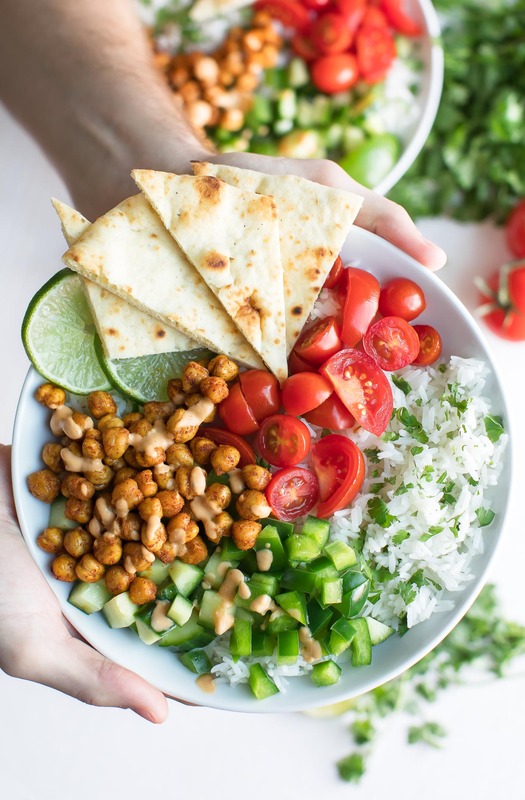 If you get a chance to try these tasty chickpea shawarma bowls, let me know! Leave some love in the comment form below or tag your photos with @peasandcrayons on Instagram so I can happy dance over your creation! I can’t wait to see what you whip up! These are a delicious option for a meatless meal! Thanks. This looks so incredibly flavorful and healthy! I could eat this for lunch every day! These look amazing. I’m totally making them.